Learn how to make a fun 2D physics game called Monkey Jump in this 3-part tutorial series covering Physics Editor, Texture Packer, and Cocos2D. Update 6/26/2013: Updated for Cocos2D 2.X and latest version of Texture Packer and Physics Editor. 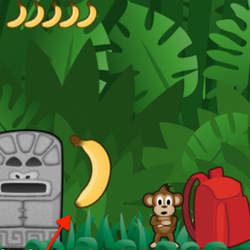 In this tutorial, you’ll learn how to make a game about a monkey having a rough day. He’s just minding his own business, but these crazy objects keep falling from the sky! By the end of this tutorial, you’ll have created a cool physics-enabled game, and learned how using TexturePacker and PhysicsEditor can save you a ton of development time. To go through this tutorial, you should have some basic familiarity with Cocos2d. If you are new to Cocos2d, check out some of the other tutorials on this site first. You will also need a copy of TexturePacker and PhysicsEditor. 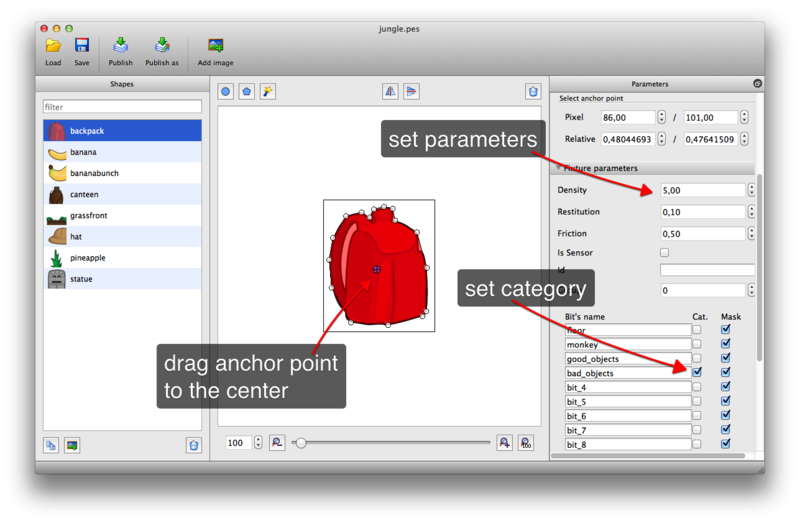 To go through this tutorial you can use an evaluation version from TexturePacker and PhysicsEditor. The trial versions work well with the tutorial. Ready to make that monkey jump? Keep reading to get started! Before diving into code, it’s best to think about the design of the game first. Let me give you a brief overview of how the game will work. As you’ve seen, your main character will be a monkey. You’ll control his movement with the accelerometer – that is, by tilting the iPhone or iPad left and right. The monkey will jump when the screen is tapped. During the game, items will drop from the top of the screen, and the dropping frequency will increase the longer the game continues. You will have a drop indicator to show the player where the next item will fall. 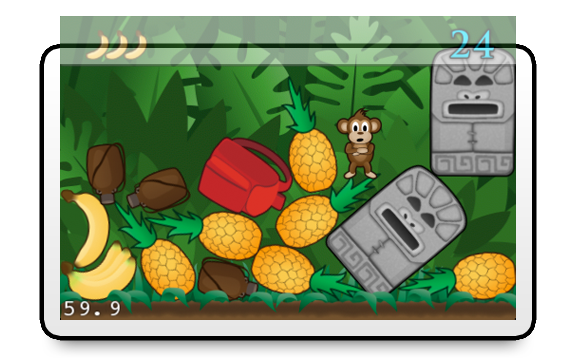 Items will pile up, and the monkey must stay on top to stay alive. 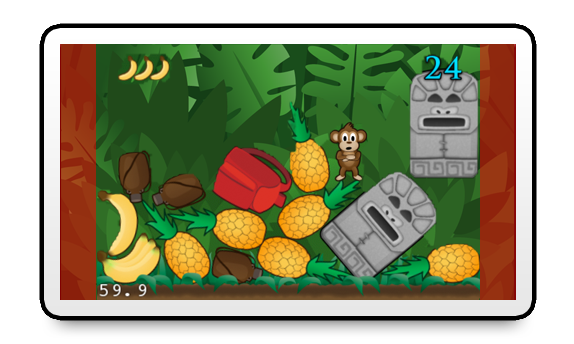 There will be two sorts of items: those that hurt the monkey, and those that heal him – namely, bananas! 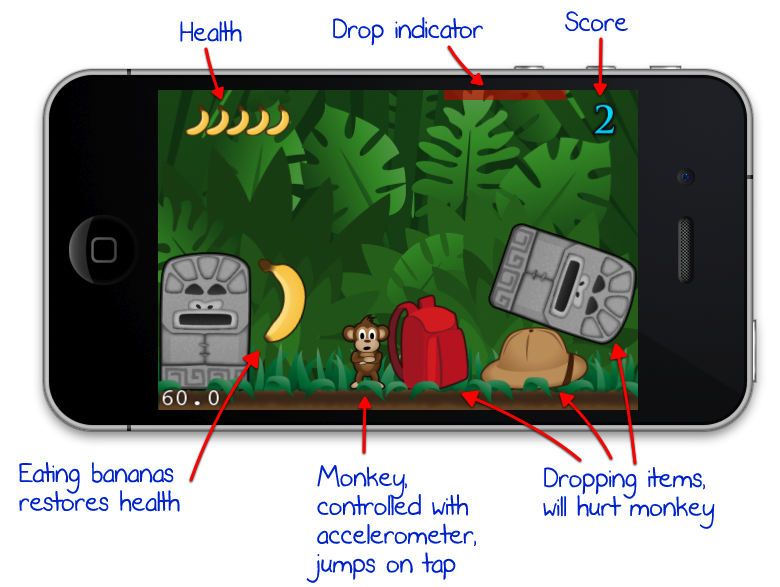 The monkey’s health will be displayed in the top-left corner as a bar of bananas. 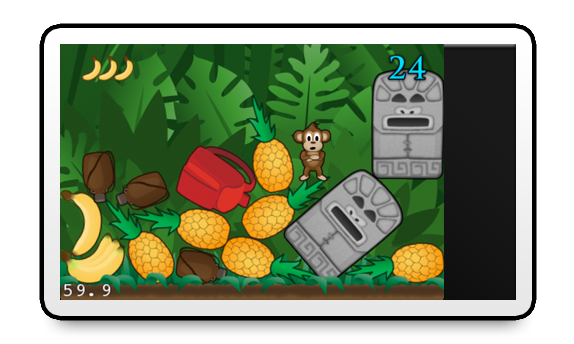 The score will be displayed in the top-right corner, and will be at the height of the highest item on the stack. When this tutorial was first written, iPhone 5 was not available yet, so the tutorial only had to support a single aspect ratio (3:2, or 960×640 pixels on retina devices). With iPhone 5 you have a new wider aspect ration to deal with (16:9). It has a resolution of 1136×640 pixels – which means that you have to fill an additional 176 pixels in the width. If you were to use the artwork from the original tutorial without any changes, you would have a black bar on the right side of the screen – which is obviously ugly. One way to deal with the problem is to scale the scene to fit the width. Scaling up from iPhone 4 with 960×640 results in a virtual screen size of 1136×757 pixels – which is 117 pixels that are not visible on iPhone 5. This is a good solution in many cases. But it would change the gameplay for MonkeyJump – making it harder for iPhone 5 players since they have less space on the screen. In this tutorial, you are going to do a mixture of both. 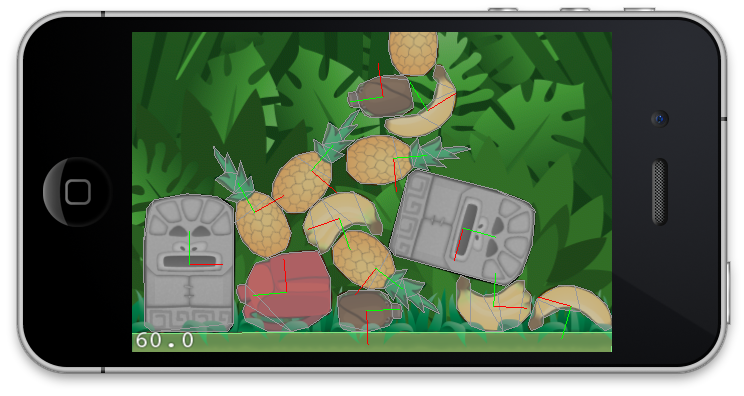 You’ll use the same sprites and playfield size as on iPhone 4 – but you will scale the background to fit and center the playfield. The result already looks promising, but not perfect. The objects would pile up near an invisible border. That might be nice for a science fiction game with force fields, but not for the jungle setting. To fix the issue, you’ll add some leaves as a border on each side. They’ll be in the foreground – occluding a bit of the game field – building the barrier to the left and right. You’ll make them scroll slower when the monkey jumps up. This adds some additional depth to the game and gives a nice visual effect. This is how the final game screen will look on iPhone 5. You are going to add the additional space only to iPhone 5 – the “old” devices are left without additional borders. To get started, download the tutorial source code and unzip it into your preferred location. Your starting point will be 0-BaseProject, which contains the basic Cocos2d setup and some integrated assets. I’ve added directories for several stages of the development process containing the results you should achieve. These directories will make your life easier in case you get lost, or if you simply want to skip one part of the project. 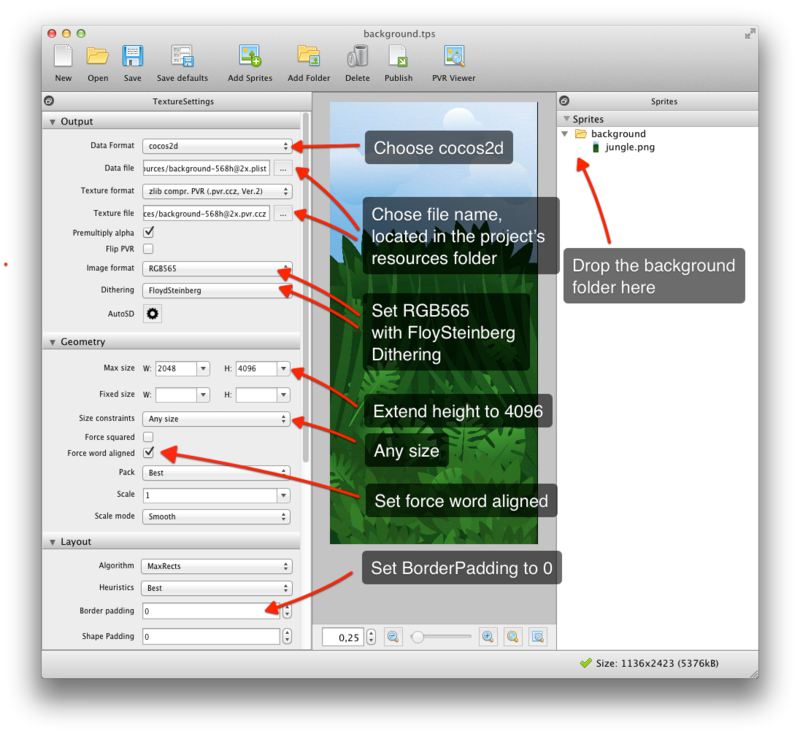 The first is called Assets, and contains such things as the TexturePacker and PhysicsEditor save files, a directory holding the Xcode project, and a free game art pack created by Vicki Wenderlich. 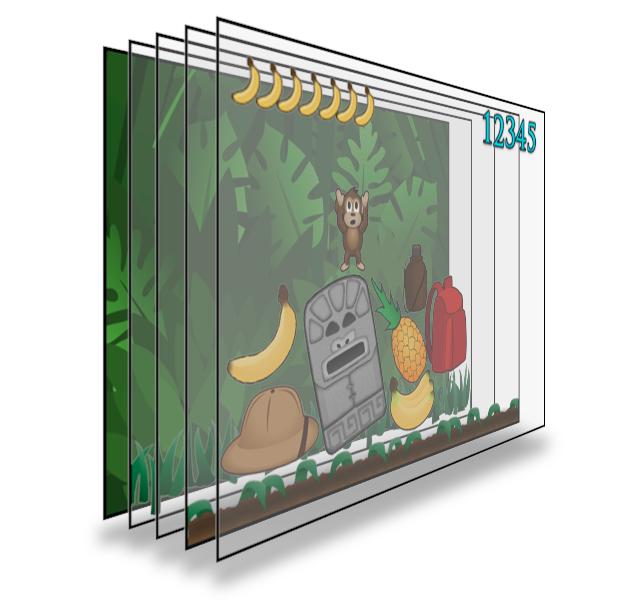 The Assets folder is organized further into the subfolders background, containing the background graphics, and jungle, containing the foreground objects and animation. Time to start the real work, beginning with sprite sheets. Open the 0-BaseProject folder and have a look at the Assets folder. I’ve already arranged the images for you. You’re going to add the sprites from the background folder into one sprite sheet, and the sprites from the jungle folder into as second. The background sheet will use RGB565, a 16-bit image format that reduces the amount of memory used by 50%. Using RGB565 will also speed up rendering. The foreground sheet, with most of the content, will use RGBA8888 for full quality. For more information on pixel formats with TexturePacker, check out this tutorial. Let’s start by creating the background sheet. 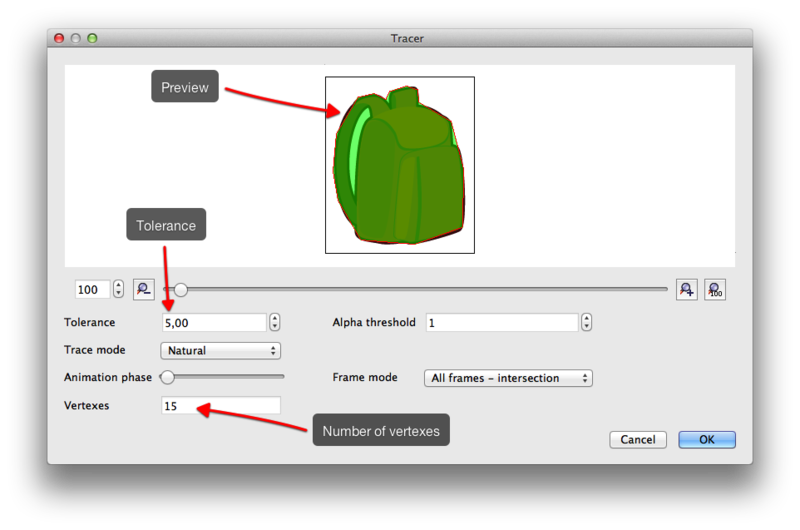 Start TexturePacker, navigate to the O-BaseProject\Assets\background folder in Finder, and drag it into the right-hand side of the TexturePacker window. It will be blank at first, but don’t worry – that’s just because this is a big image. To get it to show up, set the Max Size W and H values to 4096. Now that the sprite sheet is big enough, you’ll see the image appear. Below is a screenshot of what you’ll see and the settings you’ll be changing. You can either change the settings by following the screenshot, or keep reading and I’ll walk you step-by-step through the process, along with an explanation of what each setting does. 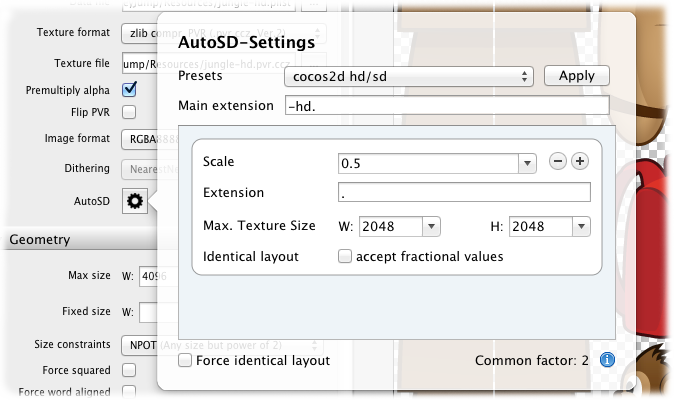 To set up the parameters for the texture, first set the Data Format to Cocos2d. Next set the Texture format to .pvr.ccz. The main advantage of pvr.ccz is that it can be loaded quite fast, and it usually consumes less memory than PNG. You may see a warning sign at this point next to Premultiply alpha. Move your mouse over that, and select Enable premultiply alpha to suppress the warning. Pre-multiply means that all color values get multiplied by their transparency value when saving the file. This speeds up graphics rendering in the game, since the multiplication step does not need to be performed at runtime. Next, change the Image format to RGB565. This means that you are using only 16 bits to store color information, down from the default RGBA888 (32 bits). This results in some incredible memory savings – if you look in the lower right of Texture Packer, you’ll see it’s gone down from 32768KB to 16384KB! You might have noticed by doing this, the quality of the image has suffered a bit. You can see that the gradients are now not as smooth and have some artifacts called banding. You can compensate for this by setting Dithering to FloydSteinberg. Set Size constraints to Any Size. First generation iPhones required textures to be a power of 2, but newer devices all can handle non-power-of-2 sizes. Also check Force word aligned. Word aligned means that the number of bytes per row can be divided by 4. If you have an odd width like 1011px (that is 1011 pixels/row * 2 bytes/pixel = 2022 bytes/row, which isn’t divisible by 4), TexturePacker will extend the sheet to make it 1102px wide – that makes 551 words. This is important to set because 16-bit textures like the background require it. If you forget to set this, Cocos2d will warn you and instruct you to play with the width of the sprite sheet until it’s an even number. Next, set the Data file to background-568h@2x.plist in the Resources directory of the Xcode project. This will automatically set the Texture file to background-568h@2x.pvr.ccz. Don’t worry that the paths are displayed as absolute paths. TexturePacker creates a relative path to the document file as soon as it is saved. This means you can move your project around as long as you don’t change the relative position of the assets and resources to the saved .tps file. The -568h@2x extension is important, because TexturePacker can save retina display and reduced-resolution images for older devices. To enable this, simply click on the cog wheel in the AutoSD option. In most cases using one of the presets from the top of the dialog is sufficient. But in this case you need some detailed control. Set the Main extension to -586h@2x.. This part of the data and image file name will be replaced with a different extension for the scaled variants. Press the “+” button to add a scaling variant for retina display on iPhone 4. Set Scale to 0.84507 – that’s simply 960 divided by 1136 – scaling the iPhone 5 background down to iPhone 4’s width. Set the Extension for this variant to -hd. (don’t forget the “.”). Use an H value of 4096. Press the “+” button again to add another scaling variant for non-retina displays. Set Scale to 0.422535 – that’s simply 480 divided by 1136 – scaling the iPhone 5 background down to iPhone 3GS’s width. Set the Extension for this variant to . (yes – a single “.”). Finally, click Save and save your Texture Packer file inside your project’s Assets folder, named background.tps. Then Publish. This creates six files in the Resources folder: background-hd-568h@2x.plist, background-568h@2x.pvr.ccz, background-hd.plist, background-hd.pvr.ccz, background.plist and background.pvr.ccz. 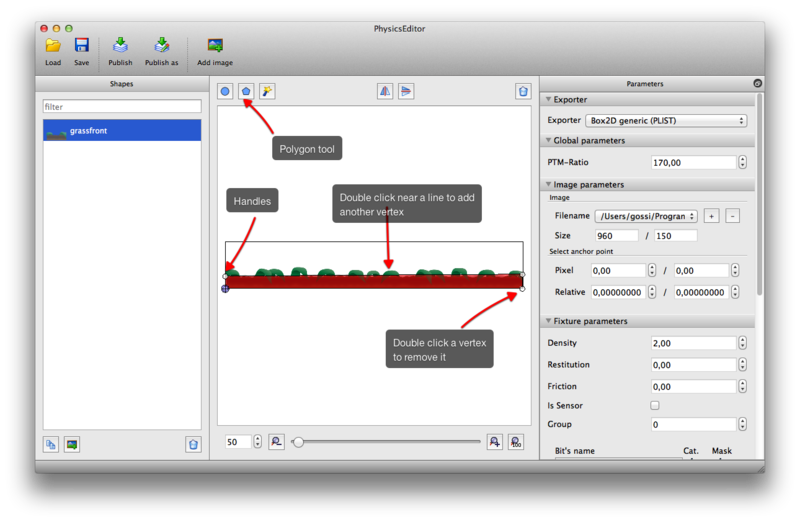 Now create a new sheet for the foreground by pressing the New button on the toolbar. Drag the complete jungle folder from the Assets folder into the empty right pane. See how TexturePacker builds the complete directory structure on the right pane? You can expand the tree view by pressing the arrow button to the left of the word “jungle”. You are using a feature called Smart Folders, where TexturePacker rescans the directory every time you add sprites to the folder. If you want to add a new asset, or rename or change an existing asset, just drop it into the folder on your file system, and when you re-enter TexturePacker it will automatically update the sheet. Yellow folders are the main folders you added, blue ones are folders found in the directory structure. Note: If you need to update many sprite sheets at once, you can switch to Terminal and update all .tps files from the command line by calling TexturePacker *.tps. You no longer need to worry about sprite sheets – just add the sprites to your Assets folder, and you’re done. If you use version control, sprite sheets will hang around as binary blobs. This will grow your working copy size pretty fast, especially when using Git or Mercurial for version control. The easy way around this is to simply not add the sprite sheets to version control, and instead create them on the fly. 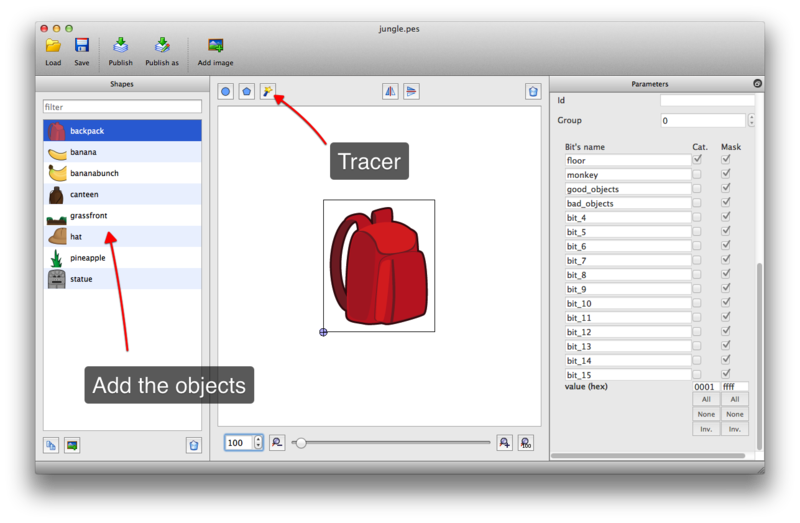 For more information on integrating TexturePacker with Xcode 4, check out this tutorial. For the options, you’ll use a nearly identical setup as for the background sheet (see screenshot above). Just make sure to leave the image format at RGBA8888 for full quality. 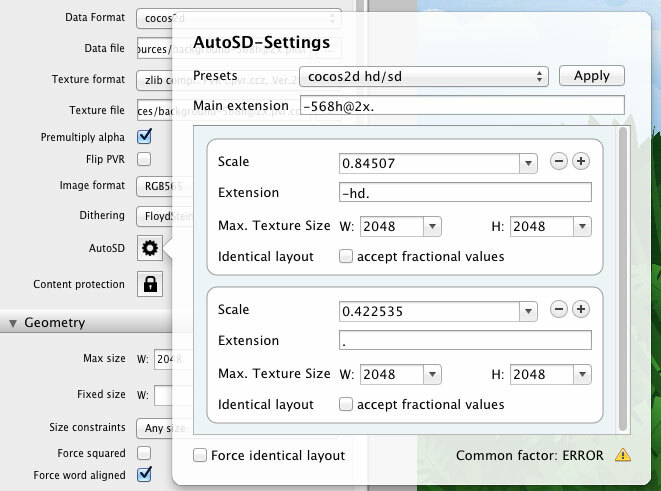 In AutoSD simply select cocos2d hd/sd and press Apply. This sets the 0.5 scaling for retina and non-retina display images. Also be sure to leave the padding at the default of 2. This will reduce artifacts on the sprite borders. Sometimes OpenGL drags in pixels from neighboring sprites. Padding avoids this problem by adding transparent borders around the sprites. Note: If you want to use sprites as tiles with seamless connections, you must use either select extrude or reduce border artifacts, which replaces the transparent borders with colored ones. If you do not do this, you might get transparent lines between the tiles. Set the Data File to jungle-hd.plist in the Resources folder of your Xcode project. This will automatically set the Texture File to jungle-hd.pvr.ccz. Finally, save the sheet as jungle.tps in the Assets folder and click Publish. 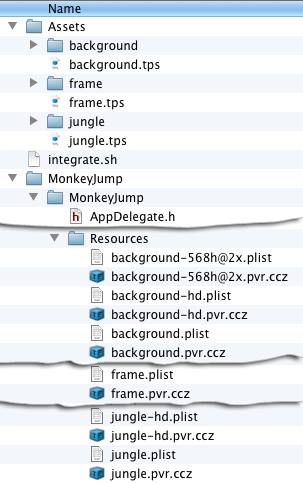 This creates 4 files in the Resources folder: jungle-hd.plist, jungle-hd.pvr.ccz, jungle.plist, and jungle.pvr.ccz. Check and see if they are there. 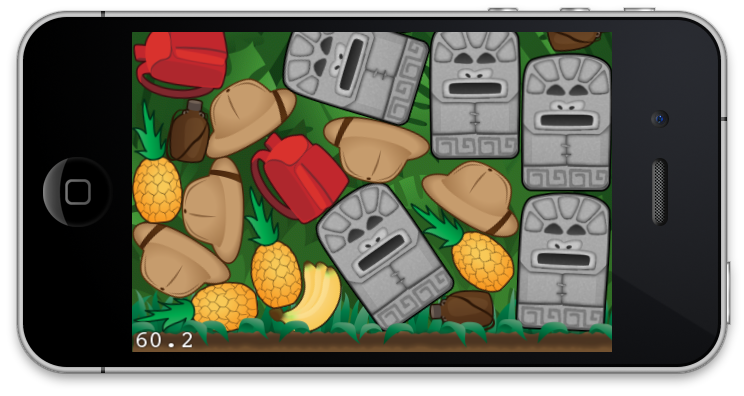 You need one more sprite sheet – this one for iPhone 5, to contain the tree left and right which occupies the additional space. You can’t simply add the tree to the jungle sprite sheet since the tree is more than 2048 pixels high. iPod 4G only allows a maximum texture size of 2048×2048. You could split the tree into 2 parts and join it by using sprites on the device – or create another sprite sheet which is only loaded on iPhone 5. I prefer the latter since it makes things easier and avoids loading additional bytes on most of the devices. You’ll be using almost the same settings as for the jungle sprite sheet. To avoid re-configuring all the settings, you can set the settings you currently have in the jungle sprite sheet as your default settings. To do this, click the Save defaults option in the toolbar while the jungle is opened. Then open a new sprite sheet, and it will contain the settings you just saved as defaults. Open AutoSD and clear Main extension and press the “-” button on all list items. Then drag in the frame folder instead of the jungle folder, and make sure the Max Size W and H are set to 4096. Save the file as frame.plist and frame.pvr.ccz. Next you’ll set up the physics shapes with PhysicsEditor. Launch PhysicsEditor, and start by setting the Exporter to Box2d Generic (PLIST). I made an Objective-C loader for this format that you can use in your Cocos2d projects. If you are not satisfied with the formats supported by PhysicsEditor, you can simply create your own custom data exporter. Next set the PTM-Ratio to 170. This tells Box2d that 170 pixels are equal to 1 meter (39.37 inches), the internal measurement unit of Box2d. 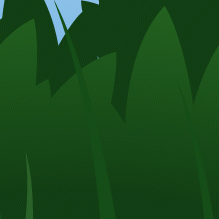 I chose 170 pixels because this is the monkey’s height, and he is going to be 1 meter tall in the simulation. You’re going to create all the physics shapes for the high-res sprites only. This is okay, since you want the physics parameters to be identical on retina display and older displays. Creating different shapes for different screen resolutions would create different masses for each object, resulting in different physics behavior – which you don’t want! The idea is to run the same simulation on all devices and only adjust the visuals. You’re now going to create your first shape by hand. 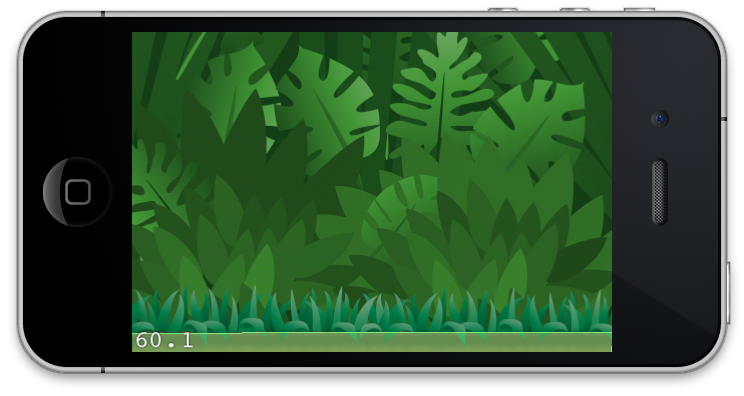 Drag the jungle/floor/grassfront.png shape onto the left pane of PhysicsEditor. When you do this, the shape will also appear in the center pane, which is the main editor area. Note the small blue circle with the cross inside: that is the anchor point of the shape. You’re going to leave the anchor point for this shape where it is, on the bottom left corner. Later on, I’ll show you how to change the anchor point. First use the polygon tool from the top tool bar. As soon as you click on it, a small red triangle appears. You can drag this triangle with your mouse. The handles allow you to change the triangle’s shape. Double-clicking somewhere near a line will add an additional vertex. Double-click the vertex to remove it. You do not have to care about things like polygon orientation or convex or concave shapes. This is all handled by PhysicsEditor. Since the floor is going to be a static shape, its parameters are going to be very basic. Density affects the weight of a body/fixture. Since the floor will not move, the value of the density is of no importance and you can leave it at the default value (2.0). Restitution is the degree a colliding shape will rebound from another object. For the floor, you want to keep this at 0. Friction is the only important value here, as it determines how much the sprites will slide on the floor. Set this to 0.7. Ignore the other bits – you don’t need them. Cat. stands for Category – it describes the type of an object. An object can be part of multiple categories at once. Mask describes which objects it can collide with. Two objects can collide only when Object B’s bit category is of a type that has been selected as a mask for Object A, and vice-versa. Tick the Category field for the floor bit since this shape is a floor, and then the Mask field for all the bits. This enables collision between all objects and the floor. Save the project as shapes.pes inside the Assets folder. Creating shapes by hand isn’t always fun. So let’s use the magic wand tool and let PhysicsEditor do the work for you! 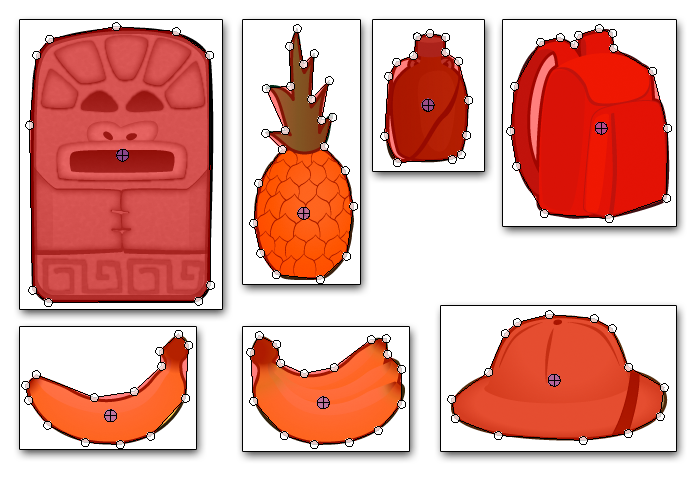 Drop the following objects onto the left pane: backpack, banana, bananabunch, canteen, hat, pineapple, and statue. Select the backpack, and click the magic wand icon on the tool bar. This will open a new window, the tracer. The tracer shows the current shape with an overlay of the traced shape. The most important setting is the Tolerance. This value tells the tracer how exactly the polygon should match the shape. It directly influences the number of vertices the polygon will have. For example, setting the Tolerance to 20 will result in a 5-vertex polygon that no longer fits the shape; setting it to 1 creates a perfectly-matching polygon with 39 vertices. Set the Tolerance to 5, which gives you an acceptable match with about 15 vertices (the exact amount sometimes varies with the starting point of the tracer). That’s fine! Click OK to get back to the main screen. If you want you can fine-tune the shape, but don’t be too finicky! 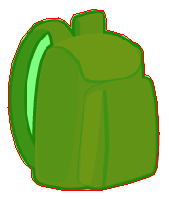 Now set the backpack’s parameters. Set the Density to 5.00, the Restitution to 0.10 (so that the backpack bounces a little bit) and the Friction to 0.5. You might want to play around with these parameters later to get a better feel for how they work. In the collisions section, tick the Cat. box next to bad_objects and make sure no other categories are selected. Also enable collision with all other objects by making sure all the Mask boxes are ticked. Drag the anchor point (the blue circle with the cross inside) to the center of the backpack shape. Alternatively, you can set the anchor point to the exact center of the shape by setting the Relative anchor point values in the right sidebar to 0.5 and 0.5. Now that you know how to create shapes, either by hand or using the tracer, go ahead and do the remaining ones yourself! Use the parameters indicted in the table below. And don’t forget to drag the anchor point for each shape to the position indicated in the images below. The first idea that comes to mind is to add a collision polygon for each animation frame to make a perfect match for each phase of the animation. But this would be a bad idea. First of all, the frequent exchange of fixtures would consume a good deal of CPU power. But the bigger problem is that with each new shape, the mass of the monkey would change! This is because Box2d calculates mass based on a polygon’s area and density. If you change the polygon, the monkey will gain or lose weight! And this will lead to the physics simulation behaving erratically. The solution is to make only one shape for the monkey, which you will try to make as good a fit as possible. 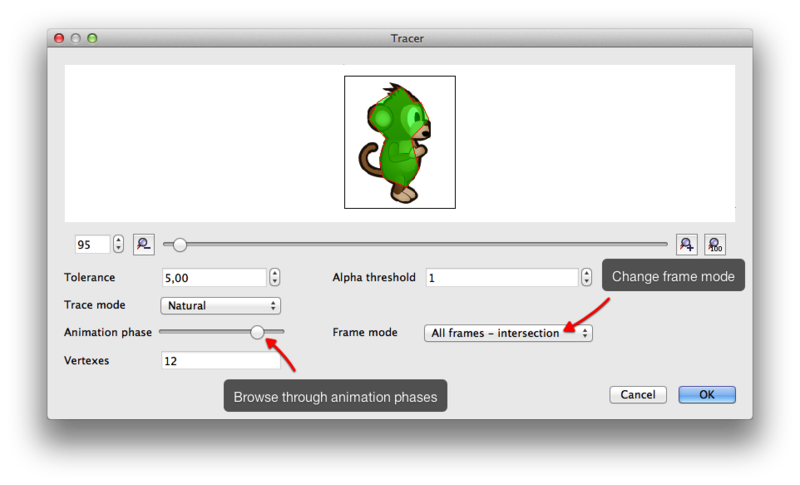 To begin, drag one of the monkey shapes onto PhysicsEditor (for example, walk\right_1.png will do fine). Then double click the shape in Physics Editor, and rename it to monkey. 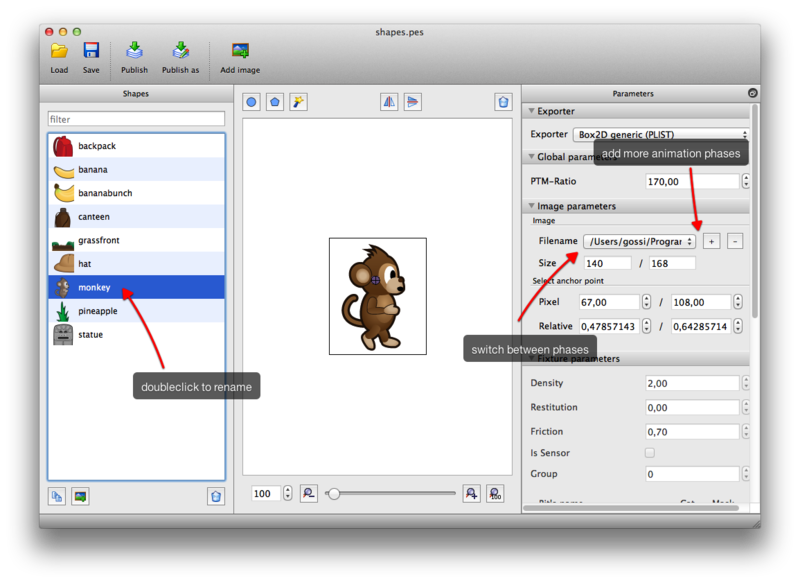 Now click the “+” button shown in the screenshot above and add the other images for the monkey (you can just select all the pngs in the monkey folder). The files will show up in the combo box and you can switch between them to look at them at a glance. Start the tracer by clicking on the magic wand icon. What you see now is that the shape does not fit the monkey anymore. This is exactly what you want. The tracer is now in animation tracing mode. You can switch between two frame modes: intersection and union. Intersection creates the polygon only from the parts that are covered by all sprites, whereas union uses the parts that are covered by any sprite. Choose intersection. The slider allows you to browse through the animation phases and see how the shape fits the different phases. If you want, you can add one of these shapes to the monkey as a temporary estimate. This will help you make your own shapes that fit the monkey’s animation frames. Or you can just click Cancel to dismiss the dialog and build it yourself – it’s up to you. Sometimes polygon shapes don’t slide smoothly over other polygons and stick to each other. This is why you’re building the monkey from circle shapes. The other reason is that using circles results in faster collision detection. The math to check if a point is inside a circle is much simpler than that for testing for a point inside a polygon. So you’ll save CPU power. You’ll delete the tracer shape after the other parts are set up. First build the head of the monkey. Use a circle shape and make it as big as the traced version. The head must be treated differently from the other body parts, since you want the monkey to get hurt when objects land on his head from above. To distinguish the head from the other parts, set the Id to head. Set the head’s category to monkey, and make sure it collides with good_objects, bad_objects, and floor. Set the density to 2.0, the restitution to 0.1, and the friction to 0.5. Next build the body of the monkey from two circles, one covering the torso and one the legs. For both, set the Id to body. Set the body’s category to monkey, and make sure it collides with good_objects, bad_objects and floor. Set the body’s density to 2.0, its restitution to 0.1, and its friction to 0.5. 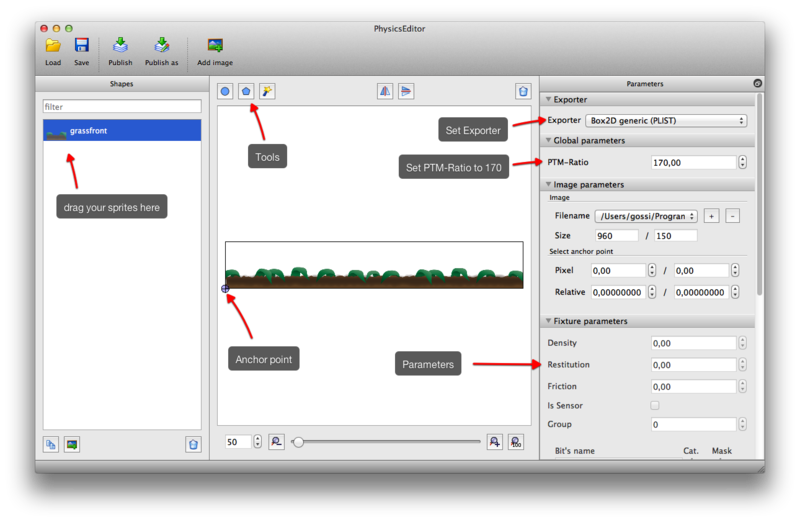 Cycle through the different animation phases by selecting the different images from the Filename combo box. Check if the circles fit all phases. It doesn’t have to be a perfect fit, and you can come back to PhysicsEditor any time you want to tweak the collision set. If you added the polygon from the tracer earlier, delete the polygon created with the tracer now. During the game you need to check if there are objects to the left or right to trigger the push animation. To do this, place two sensors on the left and right sides of the monkey. Sensors are fixtures that don’t interact with other bodies and simply report collisions. So to make a fixture a sensor, select each sensor shape and check IsSensor. Set the Id to push_left for the left sensor and push_right for the right one. 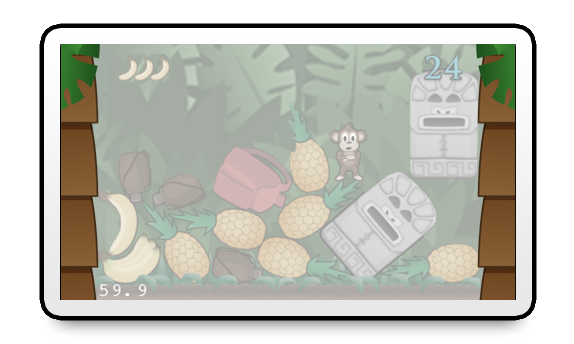 For each shape, set the category to monkey, and make sure it collides with bad_objects only – you don’t want the monkey push the floor and the bananas away! One last thing to do: save and click Publish! When asked for a location, store the file in the Resources folder of the project as shapes.plist. That’s it for now in PhysicsEditor. Next you move to Xcode and start coding your game! Next, open up the Xcode project that you downloaded earlier from the tutorial source code (0-BaseProject\MonkeyJump\MonkeyJump.xcodeproj). I created this starter project using the standard Cocos2d+Box2d template that comes with Cocos2d and removing all the demo stuff. I also added the sound resources and some classes which will make your life easier when working with Box2d inside Cocos2d. One important thing to know about this project is that all files must have the .mm extension instead of .m. This is because Box2d is C++ based, so you must use Objective-C++ for development. Note: If you get strange errors during compilation – like MonkeyJump/libs/Box2D/Common/b2Settings.h:22:10: fatal error: 'cassert' file not found – this is because a file including the b2Settings.h still has the .m extension. It can’t find the C++ header files required by Box2d because the compiler assumes that it’s a C file. Changing the extension to .mm fixes the issue. First let me give you some information about GBox2D. GBox2D is an Objective-C wrapper for Box2d that I developed for my own games. GB2Engine: This class wraps the Box2d world simulation. It runs the simulation, updates all sprite positions and rotations and can iterate through all objects in the world. It is implemented as a singleton class to make access as easy as possible. GB2Node: This class combines a CCNode and a B2Body. It’s the glue between the physics simulation and the graphics representation inside Cocos2d. It also contains selectors for simple management of the physics object and implements a proxy to access the inner node’s data. GB2Sprite: This class is derived from GB2Node and specializes in using CCSprite as the inner object. GB2DebugDrawLayer: This is a Cocos2d layer that wraps the debug drawing. It can be added to your project like a normal layer. When added, it will draw the physics shape outlines. The nice thing about it is that it detects when running on a retina display target and scales the content accordingly. GB2Contact: This structure will be passed as parameter to an object when a collision is detected. Both objects involved in the collision will be called for each single point of contact. GB2WorldContactListener: This is a C++ class that reacts to collisions in the physics simulation. If you’re curious, go ahead and scan through these classes to get an idea of what they do. Don’t worry if you don’t understand what they’re doing – you’ll learn how to use them it in the next few sections. GBox2D makes collision detection a piece of cake! This is because you do not need to create one huge switch-case statement or a series of if-else cascades to detect the various possible collision combinations. 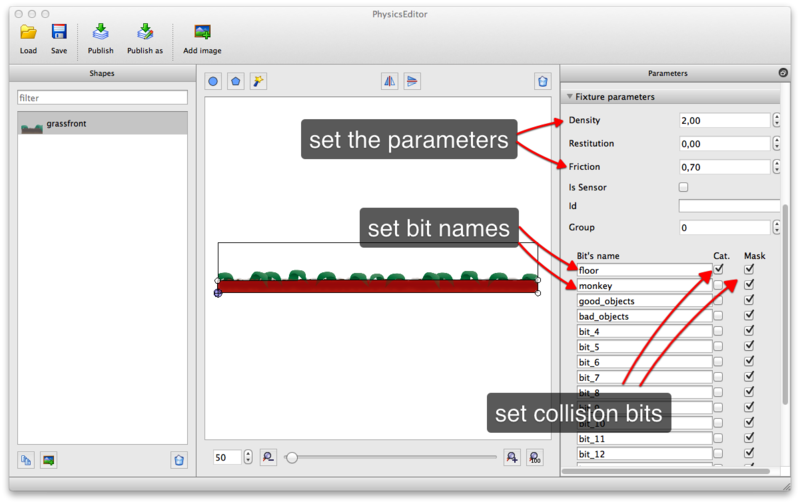 The collisionA and collisionB parameters contain collision information, e.g., which objects and which fixtures took part in the collision. You will use this information to see if the monkey was hit on his head or body. First I set the default pixel format of the frame buffer to RGBA8. That means that the game gets the full 24-bit color depth. I disabled the depth buffer, since you don’t need it. The next important thing to set is pre-multiplied alpha. This is because you use pre-multiplied PVR images created with TexturePacker. If you don’t set pre-multiplied alpha, your images will have dark borders. Since you’re going to use the random generator to select objects to drop, you have to seed it. The best way to do this is using time(). If you forget to seed the random generator, you will still get random numbers – but they will be the same with every start of the game. Since I knew I wanted to loop the music, I made things easier on myself and chose a theme without a vocal track. The sound effects for the objects were obtained from http://soundbible.com (thanks to Mike Koenig). Some of them were created using cfxr. All sounds and the music files were converted to .caf format. See Ray’s Audio 101 tutorial for more information. If you compile and run the project, you will simply see a black screen. So let’s add some content to that screen now! The goals for this section of the tutorial are to set up the basic game layers and backgrounds, and to set up the physics engine. If you’ve followed along the tutorial so far you should have the same setup as in the 1-ReadyToCode folder. Before you dive into the code, there’s one more thing to do: add the resources you created to XCode. Remember these? Add the above files to the Resources folder in your Xcode project by Control-clicking on the Resources folder inside Xcode, selecting Add Files To “MonekyJump” and then selecting the files listed above from the project Resources folder. Now for the code. First, you need to create a “Floor” class to represent the floor for the game. Add Floor.h and Floor.mm files to your project by creating a new file with the iOS\Cocoa Touch\Objective-C class template. Name the class Floor, and make it a subclass of GB2Sprite. And don’t forget to change the extension for Floor.m to .mm once it has been created. The only remarkable line of code here is the call to the initWithStaticBody selector. This makes your object a static object – one that isn’t moved by the physics engine. It initializes the body’s shape using a shape from the shapes.plist file with the name grassfront. It also uses a sprite image with the name floor/grassfront.png that is taken from jungle.plist. Why did you derive this class from GB2Sprite instead of simply using a GB2Sprite directly? The answer is GBox2D’s collision handling, which uses the name of the class to call appropriate selectors on the colliding objects. Since you want to know when something collides with the floor, the class name for the floor object must be distinguishable from other GB2Sprite objects. You will store the objects as weak references – that is, without increasing the retain count for each object. You do not need to worry about the CCSprites being deleted. They will be added as children of the CCLayer and thus have a retain count of at least 1. This is done because otherwise you will be caught in a retain cycle and not able to free the memory allocated by these objects. For the background you have to check if the game runs on iPhone 5 and load the appropriate sheet. One way to detect this is to use the window size. The advantage of using the size is that if some other device with the same width or height comes out, the game might still adapt to that one too. The director delivers the size in points - which is 1 pixel in on a non-retina display and 2 pixels on a retina display. Thus checking for the size has to be done by checking against 568 (1136/2). You also need to check against height and width because the orientation changes after startup phase and width and height are swapped. This is also a good point to calculate the offset from the center of the screen you have to take into account for iPhone 5. The distance is (1136-960)/2 in pixels or (568-480)/2 in points. The offset for non-iPhone 5 devices is 0. To center the game screen on the device simply set the offset value for the x coordinate. The background layer is a child of the playfield and would now leave a gap of 44 points to the left on iPhone 5. You have to move it back to the left by the centerOffsetX to center it again. On other devices centerOffsetX is 0 - so everything is fine here. Add the code to create the basic background and floor background layers to init. If you want to disable the debug drawing, simply comment out the second line. If enabled, the physics shapes will be drawn over the sprites, allowing you to see where collisions happen and if all shapes are properly aligned. There isn't anything more you have to do to add the objects to the physics world – everything else is covered inside Gbox2D! Nice – now let's add some action to the game! You have two related goals for this section of the tutorial: make your objects drop from the sky and add your sound effects. Our base class for all the dropping objects will be called "Object". It will handle the sound and some basic collision detection. You will derive other subclasses later on in the tutorial from the Object class. Object is a simple class, derived from GB2Sprite. This means that it comes with physics and graphical capabilities built in. To make your life easier, I've named the sound files in the same way as the physics sprites and the images from the sprite sheet. This allows you to simply use the object's name to create the right shape and sound when needed. You're welcome! In order for this to work, you need a property named objName - objName is passed into the initWithObject selector and stored as part of the class. RandomObject is a factory method that creates a random object and hands over the right object name upon creation. Let's now go to Object.mm. Start with some needed imports and with synthesizing the objName property. GMath.h contains some helper functions – for example, gFloatRand, a ranged floating-point random number generation. Next, add the init selector and instantiate the physics object. You can use the object's name as it is to instantiate the physics shape. For the sprite frame name, you'll need to add the folder's name (which is object) and the .png extension. Store the objName in the property – you'll need it during collision detection to play the sound effect. The next thing to add is your static factory method, which will simply create a random object. I decided to use a simple switch-case statement for this. The reason is that you'll need to create special classes for banana and banana bunch later on. These two objects get only one case entry, while the other objects get three each, so that there's a higher probability they appear more often. Switch-case constructs are quite efficient (usually implemented by the compiler using a jump table). You might save some CPU cycles by using an array with the names instead, but since the routine will be called once in a second, your way is fine. ccTime nextDrop;    // Will keep the time until the next drop. ccTime dropDelay;     // The delay between two drops. Object *nextObject;   // Contains a reference to the next item to drop. // 2 - do you have the next object? Let's go through the above code section by section. This section simply reduces the time interval since update was last called from nextDrop. If nextDrop falls below 0, it's time to create a new item to drop. If the nextDrop timer runs out, this section checks if there is already an object stored in nextObject. If so, it's set to active in here. Setting the object to active gives the physics engine control over the object. This section sets the time until the next drop to the current drop delay, and reduces the drop delay by 2%, making the game a bit more difficult with each dropped item. This section creates a new object to drop using your factory method in Object - randomObject - and sets the object to inactive, which keeps the object from dropping and participating in the physics simulation. This section gives the object a random position. The playfield is 480pt wide. The code ensures that the object's position is somewhere between 40 and 440 points. The section also sets the y-coordinate to 400 for the starting position so that the object will start offscreen from the top of the screen. The b2Vec2FromCC method is used to create a box2db2Vec2 from the point coordinates. B2Vec2FromCC transforms Cocos2d's points to Box2d's meters-based values. Finally, this section adds the object to the object layer. Notice how the items can tumble out-of-screen to the left and right? 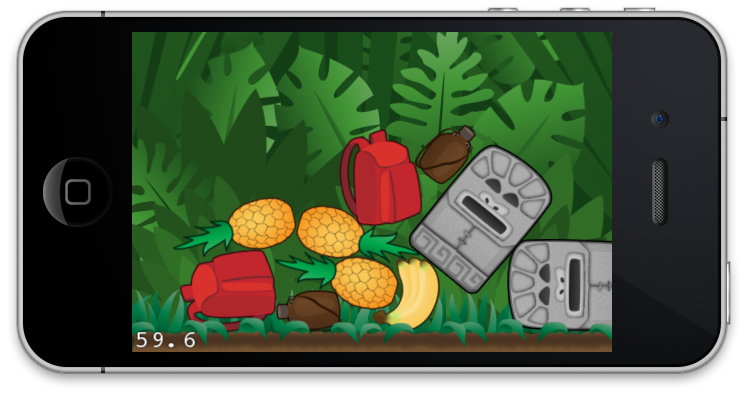 The goal of the game is to let the items pile up, so you need to add a wall on each side of the screen. To do this, simply create two new GB2Node objects. They will be out of the screen to the left and right. Since GB2Nodes add themselves to the current physics simulation, you don't need to add them manually. They are not represented graphically, so creating them will suffice. Build and run. See how the objects are now kept inside the screen by your walls? This looks nice, but there is still something missing. I think the objects should make some noise when colliding with each other. Don't you agree? I don't want the objects to make sounds all the time, just when they hit each other at a decent speed. So you'll check the object's velocity, and play a sound only when it collides at a fast enough speed. The above method must be named beginContactWithObject so that it will be automatically called by GBox2D each time two objects collide. The linearVelocity method gives you the velocity of the object. Calling Length or LengthSquared on the object delivers the velocity's value. I prefer using LengthSquared when comparing with a constant value, since it doesn't require calculating the square root of the value. You'll play the sound with a call to SimpleAudioEngine's playEffect method. The first parameter is the name of the audio file. Remember that to make your life easier I gave the sound effects the same name as the objects and sprites. So you can use the objName you stored earlier to get the right sound file. Use NSString to append .caf to the name. Add some variation to the pitch by using gFloatRand with 0.8 and 1.2. It would be boring if every object made the same sound all the time. The last trick to apply is to pan the sound's source to the position of the object. Pan allows values between -1.0 and 1.0. The object's x position (in points) will be somewhere between 0 and 480, so subtracting 240 and dividing by 240 will deliver that range. Compile, run, and see how the objects drop and make a sound upon collision. Ah, but there is one more thing I don't like about your game right now. The first item drops and then pauses in mid-air while the sound engine is initialized. Another way to improve this code would be to vary the gain of the effect with the speed of the collision. If you don't have it already, here is all of the source code for this tutorial series. 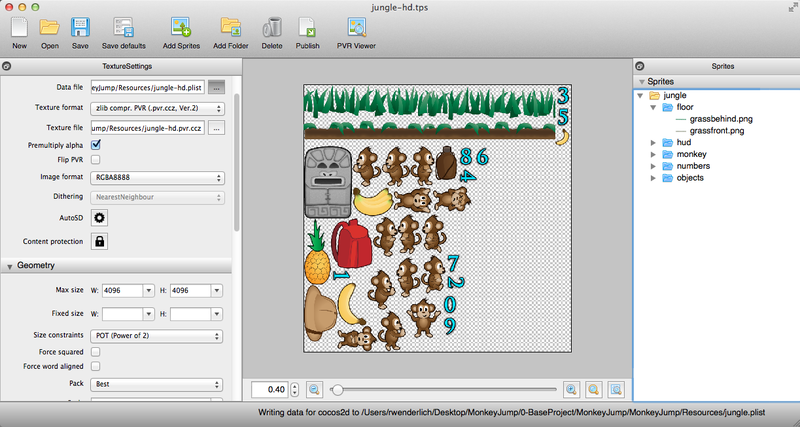 You've now reached the end of Part One of the MonkeyJump tutorial! The project in its current form is available in the source code zip in the folder called 2-DroppingObjects. 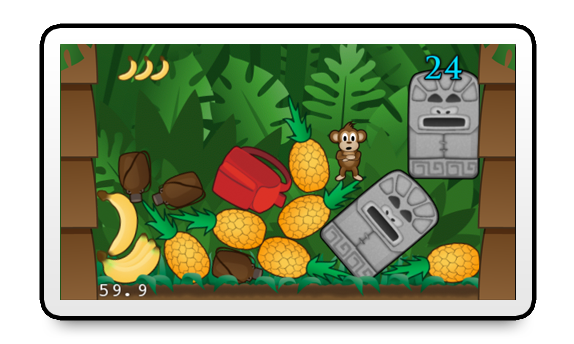 Stay tuned for part two, where you'll add your hero (the monkey), make him move and interact with objects – even make him teleport! Plus injury and death, life-giving bananas, a drop warning light... there's lots of exciting stuff ahead. Before you get there, let me know if you have any questions or comments about what we've done so far. I'll be following the discussions in the forum below.